PEWEE VALLEY, Ky. (October 2003)  Cathy Quigleys artwork is in high demand at many area craft shows. Personalization is a niche she said she has learned to fill. She will be among more than 100 featured craftspeople and artists in the Fall into Christmas Craft Show, which is part of the annual Arts and Crafts Day in Pewee Valley. The event runs from 10 a.m. to 4 p.m. Saturday, Oct. 25, featuring exhibitors set up along three locations in Pewee Valley: the Pewee Valley Presbyterian Church at 119 Central Avenue, St. Aloysius School Campus at 112 Mount Mercy Dr.; the Pewee Valley Womens Club Clubhouse at 218 Mount Mercy Dr.; and an indoor location at the old Pewee Valley Firehouse on the city square. The event is an annual major fundraiser for the Pewee Valley Womens Club. For Quigley who lives in Pewee Valley, this arts and crafts fair is convenient. She sometimes travels to as many as three craft shows a month, in locations such as Bardstown, Highview, Glendale and Ballard. 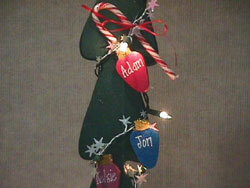 Quigley crafts personalized wooden Christmas ornaments and wooden holiday jewelry. Her hot item this year is gingerbread men ornaments, which look as if they have just sprung out of the oven. She purchases the wooden ornaments and wooden necklaces pre-made. The necklaces are often designed in the shape of snowmen and Christmas trees, which she paints in festive hues and ads beads. She next personalizes them to her customers specifications. She said her items are popular with families, teachers and children. This will be Quigleys fourth year in attendance at the Pewee Valley Art & Craft Fair. She said she has always been a creative person, and her interest in the arts slowly evolved until she began creating art to sell. Her mother, Jinny Turner, helps her craft her wooden creations. In addition to artists such as Quigley, there will be a focus on entertainment this year, said Nevins. Entertainment chairperson Marilyn Davis said, This is the first year to try entertainment. It will be ongoing, all day. The location for most of this activity will be in the middle of town, in front of the red caboose parked on Mount Mercy Dr. Opening ceremonies are scheduled for 9:45 a.m., with a flag raising and Mayor Clayton Stoess Jr. will be singing, accompanied by Richard and Anna Ray. Other performers scheduled to appear are Belles & Beaus square dancers, the Chatterbox Quartet (a barbershop quartet), Oldham County High School drama and choral departments, and clowns. Pewee Valley has a lot to offer, said Davis. She encourages Oldham County citizens, young and old, to come out for a day entertainment. Proceeds fund scholarships awarded to seniors at all Oldham County High Schools. Craft show chairperson Rose Heite said three $2,000 scholarships would be awarded this year. Profits raised would also benefit the St. Aloysius Art Education Program. The womens club is an active civic organization founded on Feb. 26, 1952, which donates time, money and services to community groups. Heite said booths would display crafts ranging from florals to wooden works, potters, ceramics, jewelry and holiday items. This juried event draws artisans from the tri-state area of Kentucky, Ohio and Indiana, said publicity chairperson Jennifer Nevins.  For more information, call (502) 222-6406 or (502) 222-4601. Back to October 2003 Articles.